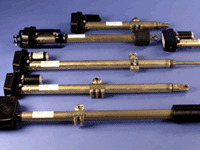 Motorized Linear Actuators by Venture Mfg. Co.
A variety of industries consist of demanding applications that feature automated devices. These can include medical equipment, agricultural machinery, engine and platform lifts, and heavy flow gates, among others. All these applications require a high level of power, speed, and efficiency to complete tasks. Venture Mfg. 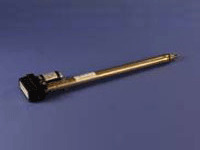 Co. provides a variety of motorized linear actuators to meet specialized automation requirements. When combined with a motor, linear actuators have the capabilities to take on applications involving high loads and precise movements. To ensure successful operations, the motorized linear guides rodless actuators are designed with a variety of beneficial features. They are primarily designed as self-contained systems an integrated power supply. 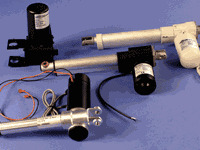 The actuators can be designed with both AC and DC motors. Integrated adjustable limit switches can be added for improved performance. For extremely demanding environments, they can be designed with a self-locking feature for improved safety. 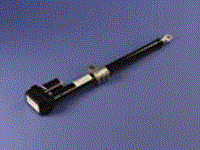 Venture has designed its precision motorized linear actuator to meet any application requirement. 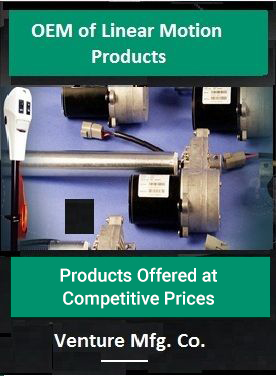 The range of specifications below showcase the versatility of the actuators, and their performance credibility. Mounting: Clevis Application Benefits : Users as well as applications can benefit immensely by choosing Venture linear actuators. They can be provided with DC and stepper motors depending on the application requirements. The motor offers excellent control as the drive source for the device. Depending on the application requirement, the motor can also be combined with mechanical components such as rack-and-pinion, or belt-and-pulley systems. Clevis to clevis mounting is an option. Venture Mfg. 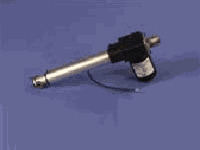 Co. provides motorized linear actuators in USA, which can support demanding industrial applications. With our durable and sturdy actuators, you can perform challenging processes with ease. If you would like to buy our products then request a quote today , so that we will get back to you as early as possible.